Before you send a job's scenes to be vectorized or rendered, you can change the job's priority level in the processing queue. Increasing a job's priority lets the system process it before other jobs in the processing queue. 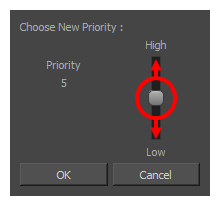 Use the Choose New Priority dialog box to change a job's rendering and vectorization queue priority. The priority is set using a sliding scale where 0 is the highest priority and 10 is the lowest. For example, if job B is before job A in the queue, you can change the priority, so job A is processed first. Changing a job's priority does not affect vectorizing or rendering jobs that are already sent in the queue. It will only affect jobs that are sent after making the change. If you want to change a job's priority after it has been sent to the queue, use the Change Priority button in the Queue window. In the Environments section, select the environment containing the job you want to change the priority for. In the Jobs section, select the job whose priority you want to change. From the top menu, select Job > Change Priority. Right-click in the Jobs section and select Change Priority. The Choose New Priority dialog box appears. Drag the slider to adjust the priority. 0 = the highest priority for processing through the Vectorize or Render queue and 10 = a priority of 10 is the least important. Items with higher priorities pass in front of other projects with lower priorities in the Vectorize and Render queues even if there is already a queue processing. Click OK. When you send this job to be vectorized or rendered, it will have this new priority in the processing queue.